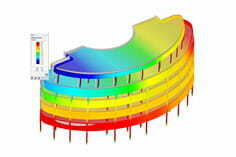 For a model calculated in RFEM, the calculation is terminated with the message that the model is not sufficiently supported, even though the member end is located on the shell of the pipe. Why can't RFEM calculate this structure? The end point of the member is located geometrically exact on the pipe surface, but the automatic integration of structural elements is possible only for plane surfaces. Because the end point of the member was not integrated in the pipe surface, no common FE node is created and the member has no connection to the pipe, thus resulting in a termination of the calculation. You can integrate the member end point manually by specifying the corresponding node in the "Integrated" tab of the "Edit Surface" dialog box. Thus, the member and pipe surface are connected, a common FE node is generated, and the calculation is performed successfully.